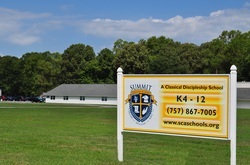 Dual Enrollment (DE) classes allow high ability students to receive both high school and college credit for select classes taken at Summit Christian Academy (SCA). SCA partners with Thomas Nelson Community College (TNCC) to offer four dual enrollment courses including Pre-Calculus, Applied Calculus, Composition, and Statistics. Qualified juniors and seniors enrolled in one or more of these institutions earn college credit upon successful completion of the course with a minimum C grade. College courses taught in high school must meet rigorous college standards for quality assurance. SCA’s instructional standards are in sync with those of other colleges including quality instructors, textbook selection, learning outcomes, and assessment. DE courses are incorporated within SCA’s regular teaching schedule, and are taught by adjunct instructors with Master’s Degrees in the content area they are teaching. 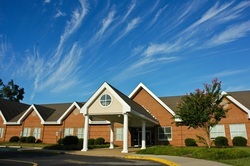 All courses are taught using the college curriculum and assessments. To qualify for DE, students must have a passing score on the college placement test or an acceptable PSAT, SAT or ACT score. Get a head start on college while in high school. Preparation for the rigors of college while in high school. Validation to colleges of the competitive nature of students. Improved GPA with weighted courses. Gain an opportunity to take fewer classes per year. MTH 163 and 164 Pre-Calculus: (Six college credit hours) Prerequisite: Students must apply to TNCC and take the placement test. TNCC notifies the school of eligibility based on placement test results. MTH 240 – Statistics (Three college credit hours) An overview of statistics, including descriptive statistics, elementary probability, probability distributions, estimation, hypothesis testing, and correlation and regression. Prerequisites: MTH 163.